Having said all of the above as a reason not to use lead core I am also now aware of the dangers of all leaders. Simon Crow�s pictures of the carp that he was unfortunate enough to pull in fixed to a fused leader give testament to the fact that even a small �adjustment� to any rig can result in a dead carp. I accept that the bead in this case had been turned through ninety degrees and had been pierced �across� the hole but I have seen this suggested in the magazines on several occasions as a solution to stop the beads slipping on the cast. In short it can�t be blamed solely against that particular angler as Simon even said that the top bead slid off easily when he tried it but that even this leader had managed to kink. Personally I feel that we should all take this opportunity to ensure that we minimize the risk as much as possible and try our hardest to use the safest rig possible for each fishing situation. I will put my hands up and admit that I use leaders when I fish the river Saone. The riverbed is so severe that I would suffer numerous cut-offs if I didn�t but I use them in a way that puts the �week link� as close to the hook as possible. My set up is 55 lb braided main line with a casting leader of 110 lb braid to withstand my need to cast 5 to 8 ounce leads. I then add a 30 lb fluoro leader of about 5 feet with my lead attached via a large eye swivel as a running rig and the whole lot is completed by the use of an 18 lb Ghost hook link. My belief is that any break should be at the hook link swivel and this fact should leave the carp with very little to get rid of. When fishing my lake I use a light lead running rig without any leader or tubing based on the same principal as above. If a snap does occur it should be fairly close to the hook. I have heard some anglers suggest that even my rigs aren�t totally safe because I could still suffer a cut off close to the rod and the carp will be left towing a length of mono. I agree that this is a possibility but exactly the same could happen with a leader and then the carp is left towing a length of mono AND a leader. I would reiterate that all it takes is for each of us to stop, before we cast out, and ask �do I really need to tie on a leader?� If it isn�t needed why use it? You may actually find, as my friends and I have, that your catch rate improves without it. After all why go to all the trouble of choosing the best main line so that the carp can�t see it and then tie on a length of material which is three or four times the diameter so that the carp can spot it more easily? If this article just gets a few more anglers thinking about fish welfare then it will have been well worthwhile. My first really disturbing discovery was a mid twenty mirror which was towing a bunch of small sticks and weed, around which was wrapped a length of lead core. There was no lead attached. The lead had been shed as it should but the lead core had still managed to wrap itself around the sticks and these had then been dragged through the weed thereby increasing the amount of snag being towed. Luckily the fish was relatively unharmed but, probably because of the weight of the lead core, it couldn�t shed the hook. It was released and in all honesty I didn�t really give it too many more thoughts and believed that it was a chance in a million that that situation could arise and it would be just a �one-off�. However, over the next few years I found another six examples of exactly the same situation and it got worse. Of the seven carp found towing just a length of lead core (I did find other carp towing rigs but these were victims of bad angling so don�t form part of this debate) all of them had managed to wind it around sticks, roots or weed but only four of them could be released unharmed. One of them (a mid thirty common) had ripped the side of its mouth so badly that it has now been nicknamed �The Pipesmoker.� Another (an upper thirty mirror) had to be re-homed because its mouth was so badly deformed that it would never again be able to eat large food items and the last (an upper twenty mirror) was found towing a very large ball of weed and the pressure from this drag had snapped its bottom jaw, leaving the jaw hanging against it�s �chest� and I was left with the sad job of killing it and burying it. Obviously, as any fishery owner facing this situation would have done, I immediately banned lead core on my lake but I also wanted to know why these fish had become snagged. Upon the compression of a big cast the lead core is stretched but on landing the sheath relaxes more than the core. A couple more casts and the core can then snap and one end of the snap can poke out through the sheath. Obviously this can become an obstruction to prevent a bead sliding off but even more worrying is that the position of this break in the core also becomes a �hinge� which allows the sheath to fold easily at that point. If the �hinged� length of lead core is pulled around a small branch it folds easily and will then allow itself to be completely wrapped around the stick and once a full turn is achieved it simply gets tighter and tighter. It is my belief that the most dangerous rig is the one left out in the lake after a casting crack off because I noticed in my casting tests that, if I wound the rig back in after the cast, the pressure of pulling it would straighten it out. Probably the act of playing a fish would have the same effect. However, if I walked out to where my lead had landed and examined the rig it had occasionally �crumpled� and had kinks and twists within its length. Now a carp picking up one of these crumpled rigs would easily be heading into trouble. I am fairly confident that hooked carp head for snags and weed beds in an attempt to �rub� the hook free from their mouths, which is probably why they are so proficient at transferring hooks to weed stems. However, with the inherent weight and roughness of lead core it drags down into the base of any weed bed or snag, and beds in more easily than a length of mono would. Add to this the kinks and twists and it then becomes easy to see that any carp which feels the tension from this material may start twisting and turning in order to get rid of this encumbrance and simply makes matters progressively worse. Keith's article is now a sticky. THE DANGERS OF LEADCORE AND OTHER LEADERS - PART 1. Right, where do I start? This is obviously going to have anglers who are strongly encamped on both side of the leaders argument. Hopefully I can complete it with sensible facts and suggestions that may make, even a few people stop and think before tying rigs with unnecessary pieces of equipment that can potentially make their rigs more dangerous than they need to be. I totally understand and agree that there will always be a certain amount of risk to the carp whenever we cast any rig in an attempt to try and catch them but I also believe that we are now finding more and more reasons to try to minimize these risks whenever possible. I also believe that this subject is coming to light now because we are all continuing to learn the �rights� and �wrongs� of carp angling as it develops. We have gone through a list of �accepted� ways of fishing only to eventually realise that we could be putting the fish at risk and to develop better ways of fishing. During the early days it was common to see carp being kept in keepnets but now this is frowned upon. Similarly we no longer use fixed leads and this is another area, which needs more examination to help it improve. Sacks, landing nets, injury treatments and many other small items show that we continue to consider and change where necessary in order to improve the way we look after our quarry and these changes need to continue. By no means do I want this article to appear to be a snipe at the manufacturers of any of the leader materials and I want to put in print just how supportive ESP have been in allowing me to put my findings and my thoughts into print. As a consultant for them it could easily have been seen as working against some of their products and even easier for them to say that they didn�t want the article written, and I would have understood that stance. However they have simply suggested that a balanced view on the debate can only be good for carp angling and that outlook has my utmost respect. I don�t want anyone to think that I am preaching from a �whiter than white� pulpit so I would just like to give you some background to my fishing which may help to explain how I have now arrived at this point. I started carp fishing in June 1967 using very basic rigs and as my carp fishing progressed so did my enthusiasm to try new approaches in order to �fool� the bigger residents of whichever lake that I was fishing. This series of developments eventually led me to begin trying lead core as a leader sometime during the early nineties. It wasn�t nearly as available then and my first batch was on a huge spool from America which I seem to remember was called �Kerplunk.� It was originally for deep water trolling and had bands of different colours for every 10 metres so that the �troller� could see how deep he was working his lures. I even went to the trouble of dyeing it to more friendly colours and used it for most of my fishing for many years. To illustrate just how much I valued lead core I even �invented� my own knot in order to �be able to use it more safely� and even now if you Google �Keith Moors Knot� you will find a series of diagrams showing how to tie it. It was not for fish welfare reasons that I stopped using it but simply because I found that it didn�t actually do what I thought that it should. I began fishing a very clear lake and had lowered my rig, complete with braided hook link, into the margins to test the presentation. The margins were about two feet deep and I am over six feet and even from that range the rig was patently obvious. What became even more evident as I knelt down to examine it further was that the lead core didn�t follow the lake contours but simply laid from mini-peak to mini-peak leaving this obvious length of �cord� sticking out like a sore thumb. I immediately changed to a very basic rig and began catching better than before so had no need to revert to using lead core again. However it was always something that remained in my tackle box for future use if needed so I hadn�t immediately become anti-lead core. In late 2001 I sold up in England and bought a house with its own lake in France, which we opened in 2002 as a fishery for English anglers. This is not an advertisement so I won�t even name my fishery but it is from this point on that I began to discover that rigs don�t always act as we expect. It became evident very early on that not all anglers had managed to interpret the published rig details in the correct manner and I was to find some astonishing rigs being used. They ranged from lead core with swivels at both ends, which the anglers struggled to understand how they could be death rigs, to helicopter rigs with knots in the leader above the top swivel �because the hook link keeps flying up the leader on the cast.� I then began to find carp towing leaders around but initially each time this happened it was a badly made rig, which was found to be the cause so I simply thought that more education was necessary. I think that the big difference was simply because I was living on the lake every day so I was seeing virtually every mistake or unpleasant situation whereas as an angler your views are more or less confined to your own swim and then only for your time at the lake. For all of the days in between your trips anything could be happening without you being aware. Really!! What the hell is this rig all about, maybe if bailifs carried out more regular barbless hook checks they would also see what they are attached to. All lakes/clubs I'm a member of have a barbless rule. Yet I've never had a rig checked yet in 30yrs of fishing. Just saying. After reading this have binned the lead core. What would make a suitable leader material for use with 15lb braided mainline? I have some clear amnesia? So. I've never used lead core before in the 15 years I've been carp fishing. So... I've just bought some thinking anglers camo green lead core and had ago at making a safe drop off system. Incase the lines decide to snap or crack off...I've designed it so the lead and the lead core drop off leaving the carp with just the rig. It looks like someone has plunged their hand into a bucket of Carp rig bits, pulled out a few and put them on to the reel line in no particular order. At one end there was a simple 8" braided hair rig, tied with what looks like a size 10 hook, and a standard barrel swivel, nothing wrong with that but it went totally bizare from that point on. The hook rig was then tied to a 44" length of 12 / 15lb line running through a 38" length of rig tube! The line then went through a lead clip, but via the large hole usually intended for hooklink swivel. On the lead clip was a quick change link, (but no lead), which was held in place by the tail rubber. The line was then tied to another plain swivel which was then attached to a clip swivel, which held a 1/2oz plummet. Finally the reel line was tied to the end of the final swivel eye, but it was somewhere in the region of 6lb line. Any leader reduces the safety of the rig. Im not using this stuff again, binned it this evening. It's not just the weight of the leader it is also that the knot at the TOP of the leader becomes the weak point so most snap offs leave the fish trailing a leader whereas with a rig which doesn't include a leader the snap off is more likely to be at the hook link swivel so the fish only has the hook link to deal with. i use tf gear lead free leaders and make sure that the lead will come off if the line was to break however i am wondering if this is ok as i have never really thought about the weight of the leader itself? enjoyed reading that. shame there are still people out their using unsafe material/rigs i've caught a few carp because they've been trailing 'death' rigs. sickens me. .....and the last (an upper twenty mirror) was found towing a very large ball of weed and the pressure from this drag had snapped its bottom jaw, leaving the jaw hanging against it�s �chest� and I was left with the sad job of killing it and burying it. This from the second page of my article which Ken has made a sticky at the head of this thread. Better you than me Keith. I'm glad you had the moral courage to kill it rather than simply return it to wash your hands of any responsibility. Not a nice situation to put in indeed. That is exactly what I would hope I would do if I ever confronted such a ghastly choice - which I hope I never do. I don't think that you have grasped the real potential danger area. It isn't just the lead that causes the problems it is the leadcore itself which is heavy enough to hold the hook in place. 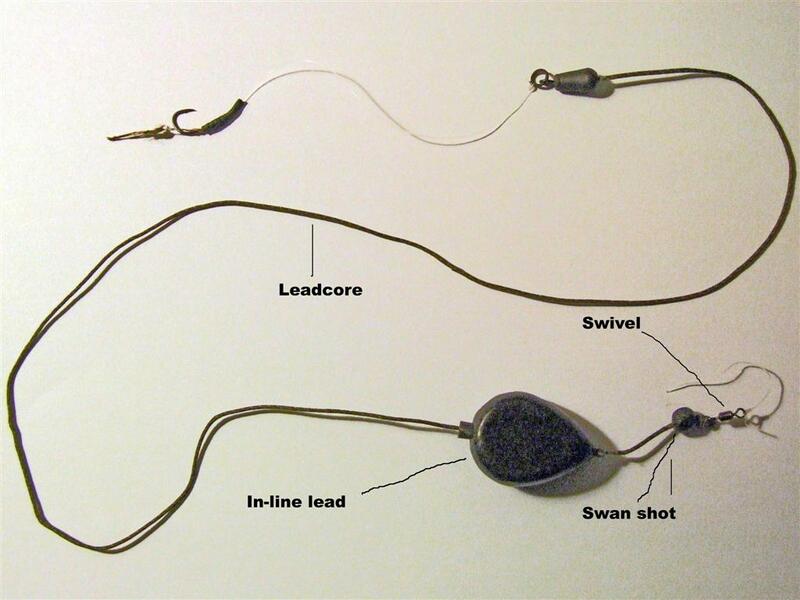 You may not be aware of any problems and unless you actually live on the lake you will be unlikely to see the problems caused by leadcore rigs which have been left out in the lake after a crack-off on a cast. Read my post again and you will see that the fish that I had to kill wasn't the result of a badly tied rig. The lead had been ejected but the leadcore alone was enough to damage the fish beyond the point of recovery. I won't be using it ever again after reading this. whilst i haven't had any problems so far in my carp fishing experience, i'm fully aware that a problem could be just around the corner and i would rather loose a 50p or what ever weight instead of loosing that beautiful carp that we all sit at the bank to catch. Thanks for taking the time to write. I was under the impression a Heli rig was safe as well. From now on it is only tubing for me. I fish a gravel pit that has a good number of bars/humps in it.i am currently using helicopter rigs on a shortish leadcore leader. If this rig is unsafe,can anyone advise a suitable alternative.I was under the impression that this rig was safest of all,as the fish is only left with the hook length. What if you snap off on the cast??? Crisis back. Use a lower breaking strain hooklength than your mainline. Boom, crisis solved. another pix of the same fish, this time better focused. That bottom pic is horrendous. 1. Why take a "virtually" invisible main line and sheath it with a section of "hose pipe" so that it becomes immediately more obvious? 2. Tubing was used for its anti-tangle properties and not for fish protection and very often it slides up the line leaving the line against the flank of the fish so the tubing doesn't come into play in that instance anyway. We also often fish floaters or zigs without tubing so what's the difference? I guess then it would be interesting to know Keith's opinion on rig tubing - be it tungsten or not, camou-ed (see-through) or not. Just read this and the photo's are appalling, guess the more people can be educated about the problem the safer our quarry will become. Never fished anywhere that required the use of a leader but appreciate the need for some venues. I would be devasted to haul in something like in the pics. Photo of a fish that was recently found alive, tethered to a branch by three feet of leadcore with a 3oz lead on the end of the heli rig set up. The top bead had been side pierced and the main line had birdsnested at the knot so even had the bead been used correctly the fish would never have been able to free itself of the rig. Proof if ever it were needed that there is NO safe way to use leadcore, even if the fans of the stuff claim that it is safe to use on a heli rig. And it is not JUST leadcore that causes the damage. This picture was posted on another forum and then a thread in here, rather than move the original thread and tidy it up I thought it best to start a new one. This is what can happen if you use leadcore with a lead clip, this fish was wrapped up and nearly lost its life because of a poor setup. When using leadcore please only use it with a helicopter rig setup, such as the chod rig for example. There is another thread in this section on how to use/tie ledcore so if in doubt please have a look there. this was sent through by another member to highlight just how NOT to tie a rig. notice how the lead CANNOT eject if the line snaps because of the swivel, even worse is that the angler has used leadcore.